Wherein Pictures Do not Aid Matters | A Daily Dose of Zen Sarcasm! It did not occur to me that the $2.49 ream of construction paper –purchased on a whim for Herr Meow’s entertainment because it sounded like a good deal for 96 pages versus a drawing pad with just 40 pages priced at $3.99– was really for me. 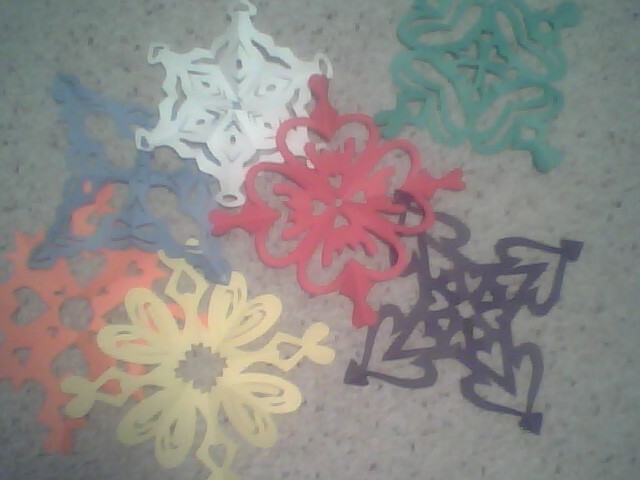 That it was really for me to discover that cutting up paper into snowflakes or doilies, which once was a fun but decidedly not that meaningful pastime, would be such a fulfilling activity that it has taken over my brain. And that, as a fringe benefit, it would also inspire Monsieur Meow to craft some kickass paper airplanes. I’ve been cutting up paper, and it’s so incredibly awesome it’s addictive. And yes, this is just a lousy phone camera picture– I would take a real picture, but I forgot my firewire/USB cable thingy at home, so there is not much can be done in that department. But okay. Just feast your eyes and behold my scissor skills. Pee Ess: Just in case anyone out there is actually impressed, I did not use any templates or sketch anything. I simply folded paper and went. Excuse me. I need to cut up more paper now. 29 Jan	This entry was published on January 29, 2008 at 11:26 pm and is filed under Crafty Samsara. Bookmark the permalink. Follow any comments here with the RSS feed for this post. soooo cool! i bet herr meow was impressed. what did he think of mommy’s artistic abilities? I am artistically declined (reclined?) in these enddeavors. Scissors + paper = stick to blogging. Those are quite nifty. Keep a-snippin’! I LOVE THEM!!! KEEP ‘EM COMING!! !